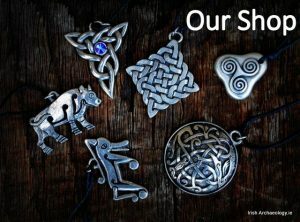 When we think about the archaeology of Dublin the first things that comes to mind are the extensive Viking remains uncovered at sites such Woodquay/Fishamble Street and Temple Bar as well as the deep deposits of medieval archaeological remains that are found across much of the city centre. However, recently excavations at number of city centre locations have revealed that Dublin has a much older, prehistoric, past (see the map at the end for site locations). The earliest of these sites was uncovered by Melanie McQuade at Spencer Dock, Dublin 1, which is situated along the northern quays, near the mouth of the River Liffey. Here a previously unrecorded Mesolithic shoreline and the remains of up to five wooden fish traps were identified. The traps, which were formed out of interwoven rods of hazel, with some alder also used, consisted of fences that were used to funnel fish into traps formed out of wattle baskets. Fish swimming in with the incoming tide would get caught in the traps and then could be retrieved by fishermen at low tide, when the structures were accessible from the shore. Specialist analysis indicated that relatively thin-bladed, smooth, stone axes were used to construct the fish traps, while radiocarbon dating demonstrated that they were built during the Late Mesolithic (c. 6100-5700 cal bc). 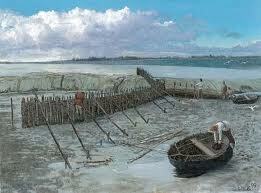 This makes them some of the oldest fish traps yet found in Western Europe. Melanie returned to Spencer Dock for a second phase of excavation in 2007 and uncovered more evidence for a Late Mesolithic fish trap (6000–5760 cal bc) as well as the partial remains of a Middle Neolithic one (3630–3370 cal bc). Thus it appears that Dublin’s earliest inhabitants may have been northsiders! Further west along the river at Hammond Lane, Dublin 7, the remains of a much truncated burnt mound were identified by Abi Cryerhall beneath a considerable depth of medieval deposits. The mound was located along the northern bank of the river Liffey and consisted of a spread of burnt stone and charcoal measuring approximately 4m long by 3.7m wide by 0.15m deep. No evidence for an associated trough survived and specialist analysis suggested the presence of alder, elm and blackthorn charcoal within the mound matrix. Radiocarbon dating indicated that the mound was Early Bronze Age in date (1938–1744 cal BC). Burnt mounds are enigmatic monuments and various uses have been postulated. They are typically located in wet places and have an associated trough or pit, which was allowed fill naturally with water. Hot stones were then placed within the pit to heat the water. After the water was heated the rocks were removed and over time this saw the growth of mounds of burnt stones, as seen at Hammond Lane. Traditionally it was assumed that burnt mounds or fulachta fiadha as they are also known – were used for cooking food but more recently other uses have been suggested such as bathing, dying cloth, brewing beer and as sweat houses. As with the Hammond Lane example, they typically date to the Bronze Age. On the south side of the river Claire Walsh uncovered additional evidence for Early Bronze Age activity at Kilmainham. This site, which consisted of small cremation cemetery, was located on a gravel ridge overlooking the River Liffey, just to the north of the Royal Hospital. In total there were six burial pits, each of which contained cremated human bone. They occupied an area measuring approximately 12m x 10m and the absence of a covering mound may indicate that they represent a flat cemetery. 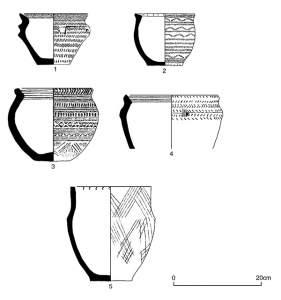 Three of the burials contained pottery vessels, while the remaining graves just had small ‘token’ deposits of burnt bone. The first ‘pottery’ burial contained a decorated food vessel, which was filled with large fragments of cremated human bone and charcoal stained soil. The bone was derived from an adult male who died sometime around 1928 BC (C 14 dating). The remaining two burials contained pygmy cups, one of which was complete and the other fragmented. Three beads were recovered from the complete vessel; two fashioned from bone and the third from pottery. This small but important cemetery probably represents the burial ground for an extended family who lived and died in Kilmainham nearly 4,000 years ago. More evidence for Bronze Age activity was also identified at Clancy Barracks, Islandbridge, Dublin 8, where the remains of an extensive riverside revetment was excavated by Kevin Lohan. Although heavily disturbed in places, this wooden structure stretched for nearly 130m in length. It consisted of a post-and-wattle fence erected a small distance into the river, with a large quantity of wood dumped behind it to consolidate the ground on the landward side of the fence. The wattle fence panels were made entirely from hazel rods that were held in place by upright posts of willow. The dumped layer of consolidating wood was dominated by oak and hazel branches, with smaller amounts of alder, elm, blackthorn and wild cherry also present. 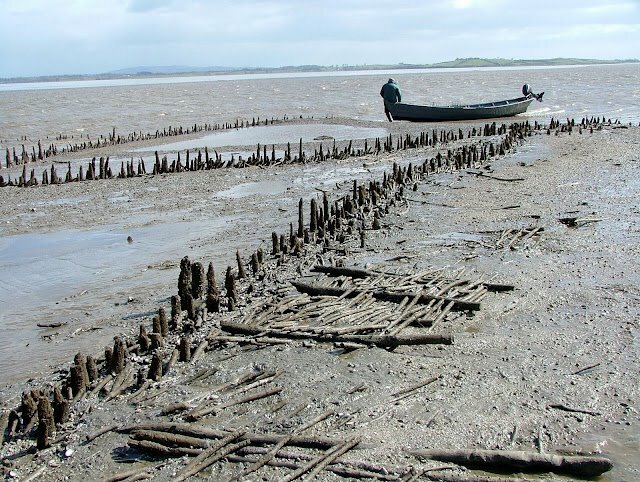 Radiocarbon analysis indicated that the wooden revetment dated form the Late Bronze Age/Early Iron age (Kevin Lohan pers. comm.). The exact function of this revetment remains uncertain, although its location right beside the ancient fording point of Kilmainham may be significant. Closer to the city centre a set of Iron Age waterfront structures were identified by Teresa Bolger at Ormond Quay Dublin 1. 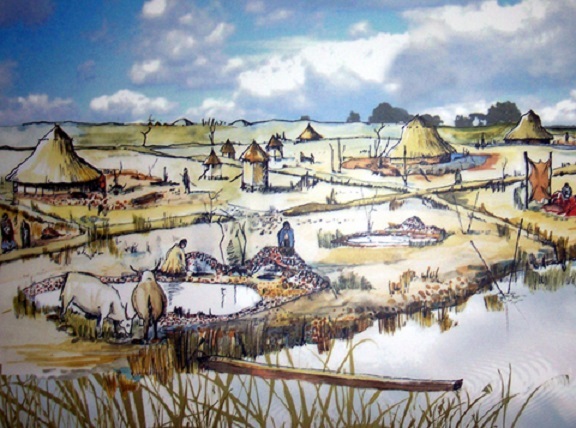 The excavation site was located near the confluence of the Liffey and one of its northern tributaries, the River Bradogue, in an area known as ‘The Pill’ during the medieval period. This district was characterised by a series of creeks, inlets and channels right up until seventeenth century. The earlier of the two prehistoric structures found at this site was a timber-laced gravel bank with an associated hurdle path, which was in turn succeeded by a brushwood platform. The structures were located at the river’s edge and were radiocarbon dated to c. 160-60 BC. Finds recovered from these Iron Age features included a number of turned and carved wooden vessels. It is probably no coincidence that most of the prehistoric sites described above where found along the edge of the River Liffey; it is likely that the deep deposits of river silts and reclamation layers found along the river’s edge afforded greater protection from the deep, truncating, 18th and 19th century basements so characteristic of the city centre. 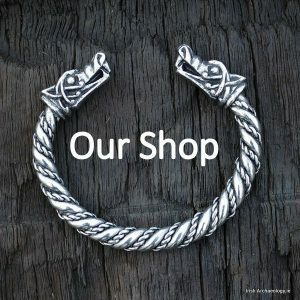 This is lucky for us, as these sites are an important addition to the story of Dublin and they indicate that the city was an attractive place to live and work long before the arrival of the Vikings AD 841. It is obvious that the Mesolithic northsiders were just fishing for the better-classed southsiders, who wouldn’t be caught dead doing such things. That aside, nice article. I wonder have there been more prehistoric sites found by other consultancies (than MGL). Great illustration from Simon, I hadn’t seen that before. Hiya Abi, Its pretty Mags centric all right :). I had a quick check through the excavation bulletins and couldn’t find any other references to prehistoric sites. I’m planning on heading to Medieval Dublin this weekend to I might ask a few of the usual suspects if they found anything really old. Hope all is well down under. Very interesting blog. I’ve often thought there must have been a Bronze Age settlement in the Dublin area somewhere along the Liffey. Maybe something along the lines of Corrstown. You can also add to that the Bronze Age axes from Trinity College and Suffolk St. and the Halberd from Bride St. Thanks Charles and good info on the artefacts. I’ll think might do another blog on all the prehistoric finds from the city centre. There must be a goof few out there. I know Abi got some nice flint scrapers from a dig on Jame’s Street. That halberd was found the same time as the Viking wasn’t it? Thanks for the article, admin. I dare to translate and publish briefs of your news in my personal site and give some notice of them in our Archaeological forum “Terrae Antiquae” (http://terraeantiqve.com) of course with links and full credits. As a former UCD Early Irish Lit. & Lang. student I keep interest in Irish History and want my spanish language readers be informed about it. No problem Mujerabol. Its great to see the information being disseminated.Best of luck with your site. Pity that the excavation at St John’s Road, Kilmainham, fell beneath the radar. 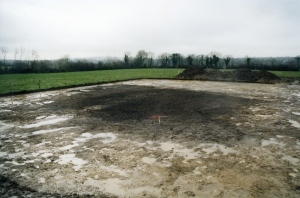 A burial complex consisting of several cremation pits was uncovered, part during testing in 2002, and the rest in 2004. One contained a food vessel, while two others contained pygmy cups. One of the pygmy cups contained three beads, two bone, one rough ceramic. Pity is right Clare, that sounds like a great site! I should have looked a little harder! They don’t seem to have inputed the 2004 excavation onto excavations.ie but the 2002 dig is certainly there. The link is below for anyone interested. Kevin’s C14 dates for Clancy Baracks can be compared with the 6thC AD dendro dates I got from the same feature when I initially tested it. Now that’s much more interesting! Sorry for the delay in replying (we are in the middle of lambing here). I managed to track down where I sourced that image (link now above), it was from a cooking website of all places. They say the illustration is based on Bronze Age Flag Fen. Sorry I can’t attribute it to an artists or publication. Edit: the image is by Andrew Hall, now correctly credited. I am working on a book about Dublin Bay: Nature and History. Would it be okay to quote relevant text from your article on Dublin: The prehistoric city? If so would you suggest a suitable citation to use in the reference list.